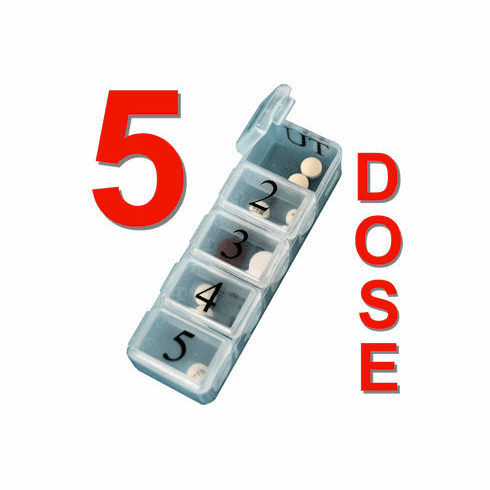 e-pill 5 Doses per Day Weekly Pillbox Organizer. Popular with Parkinson's PD Patients. Home | Pill Boxes | e-pill 5 Doses per Day Weekly Pillbox Organizer. Popular with Parkinson's PD Patients. up to Five Times per Day. This pillbox set includes Seven (7) pill boxes each with Five (5) doses / medication compartments per Day in an discreet canvas clutch bag. Popular with Parkinson's Patients or anybody taking medications up to five times per day. Organize all your daily medications once a week. Used for home, office or travel. Helps with pill identification and medication adherence. What You Get: 7 pillboxes labelled M, TU, W, TH, F, SA and SU. Each pillbox / pill holder has 5 compartments (doses) labelled 1, 2, 3, 4, 5. Black canvas organizer ('clutch bag' unisex) with Velcro lock.